Today is the 45th anniversary of Earthrise. 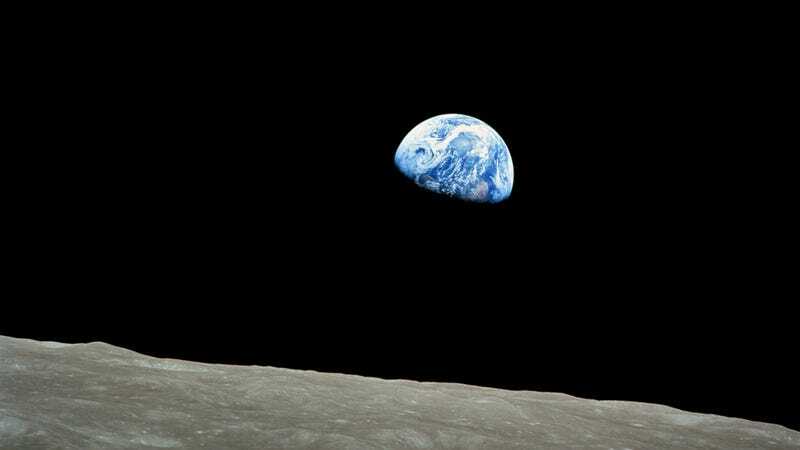 We take it for granted now but, along with Blue Marble, it's the most important and famous photo ever taken. In a world saturated with fakery and cynicism, it's easy to ignore the magnitude of its impact. But in 1968, this photo changed everything. Nowadays people don't stop to think twice about what they're seeing—that precious blue jewel engulfed in the pitch black nothingness of space. However, this was a vision that deeply affected the view of ourselves as species and our place in the world and the universe. Earthrise truly made everyone realize that we're all living in a fragile tiny ball that we needed to protect in order to survive. Humans are—for now—alone in the void. Some of the immediate and most obvious effects of these images were the promotion and passing of the Clean Water Act the Clean Air Act in the US, and the first Earth Summit, the UN Conference on the Human Environment. At the private level, people started to organize worldwide non-for-profit organizations, like Greenpeace or Doctors Without Borders. Earthrise had a profound impact on our attitudes toward our home planet, quickly becoming an icon of the environmental movement. Borman: Oh my God! Look at that picture over there! Here's the Earth coming up. Wow, that is pretty! Borman: (Laughter). You got a colour film, Jim?